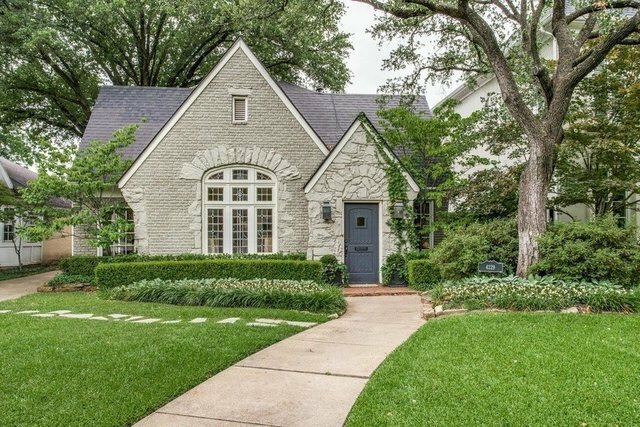 This exceptional charming updated Tudor combines a classic exterior with a fresh 2015 remodeled and expanded interior. It encompasses the charm of a traditional Tudor from the beautiful original stained glass windows and vaulted beamed ceilings with modern amenities for both entertaining and comfortable living. An open floor plan with a warm neutral transitional palette renders great flow throughout the home. The original living room with high beamed ceilings and timeless brass sconces is flanked by a beautiful light filled study and formal dining room. The kitchen, featuring Olympic white marble, new cabinets and Thermador stainless steel appliances opens to the breakfast room and den. An oversized laundry room was also added directly off the kitchen with extra storage and pantry space. The first floor master suite has a beautiful all white marble bath with a walk in closet and custom cabinetry. It offers separate sinks, a large walk-in shower and soaking tub. additional walk in attic for storage. A great open TV/gameroom area is adjacent to bedrooms. This home is conveniently located within walking distance to Bradfield Elementary, Highland Park Village and the YMCA.